Now, granted, I don’t have any kids myself, but I think if you’re going to care for a telepathic space baby that came out of a box, you’re probably better off doing it within the confines of a private residence. That’s what the Whateleys did, in the H.P. Lovecraft story The Dunwich Horror, which is what this cockamamie Leviathan storyline is based on. They had a whole farmhouse and a barn all to themselves, where they could raise their hideous blasphemies in relative peace. But Megan and Philip have been chosen by the Leviathan people to house a monstrous god-creature at their antique shop, a site which has two obvious drawbacks as a storage area for unseen horrors: employees, and customers. It probably would have been easier if they’d just closed down the shop for a while, until this all blew over. Then they wouldn’t have to worry about people examining their forbidden space artifacts, or asking impertinent questions, like why is your child mostly packaging material. So today’s episode is another excerpt from Child Rearing for the Criminally Insane, by Dr. Spock, Dr. Jekyll and Dr. Phibes. Megan is currently in the Chosen Room with baby Joseph, doing whatever you do with chosen babies. Carolyn comes upstairs to give Megan a phone message, and then she stops outside the nursery door. There’s a terrible sound coming from the baby’s room — loud, rough breathing, like somebody’s taking deep breaths into an offstage microphone. Megan emerges from the room, and gives Carolyn the stink eye. The breathing noise stops, and Megan explains that it’s just the radiator. Apparently, the antique shop has a haunted heating system, which is just typical for this town. You should hear the plumbing on overcast days. Besides, lots of people breathe. It’s not really that big of a deal. But is he? It seems to me like he’s a terrible baby, as in: he is terrible at the job of being a baby. He doesn’t cry, he doesn’t eat, he had a week-long fever after somebody shoplifted a book, and you have to invent new theories of thermal energy to explain how he sounds when he sleeps. This is possibly the worst impersonation of a baby in the history of pediatrics. Megan smiles and says, “I’m sure he’s just passing by,” but Carolyn is unnerved. So Megan says, yeah, he’s a customer. This is a store. That’s why we have a big plate glass window facing the street, so people can see inside. Has everybody completely lost track of what’s happening? The man hurries away, and then we have a little sequence where all the lights in the shop go out, one by one, for no particular reason. Carolyn and Megan just stand there, looking at each light in turn, as four different lamps burn out sequentially. So that moment raises a couple of questions, like for example: Why? How? And so on. Megan stands still and makes an inscrutable facial expression, and I don’t blame her; the script is giving her precisely zero clues about how any of these events are related. Is this dramatic power outage related to the man outside, or the baby, or the radiator? Is it supposed to scare Carolyn, and if so, why? Is the wiring haunted too? It seems like the writers are having some trouble figuring out what kind of monster they’ve got on their hands, and what it can do. It possesses people, kind of, and it makes a noise, and it shuts the lights off. 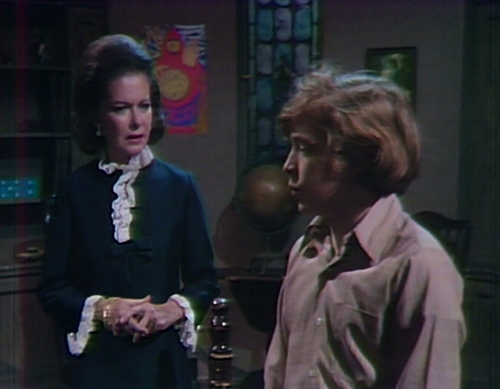 On Dark Shadows, these kinds of effects are usually associated with ghosts. But it hasn’t blown out any candles yet, or opened any doors, so it’s hard to be sure. When you have a monster that nobody’s allowed to see, what do you do with it? Lovecraft’s answer was to push over barns, but who has a spare barn these days? Cross fade to David’s room, where his magical book of ancient prophecies slowly opens, all by itself. Apparently it’s on a timer. This whole storyline is being run by a Nest Learning Thermostat. Liz stops by to see how David’s getting along with his homework, so he hides the book and pretends like he’s not ushering in the end times. She starts asking difficult questions, but then stops all of a sudden and shudders. And that’s ghosts again, you’re still doing ghosts! Honestly, this monster needs to figure out a power set. David grins, like this is one of those “and the day shall come” deals, but then it passes. He finally chases Liz out of the room by asking about her ex-husband, and we never really find out about that chill — whether it was a natural occurrence, or book-related or what. And that’s what this episode is like, just one damn thing after another. That’s not to say that it’s not enjoyable. Any given scene has its own weird little rhythm, and they’re never doing the same thing twice. David heads downstairs and has a chatty little scene with Carolyn, where he reads the newspaper and irritates his cousin by asking about her father. Then he rips out a full-page ad for a sale at Brewster’s department store, and explains that he’s making his Christmas list. She finally clears the room, and he grabs his coat and heads out the door, clutching the newspaper page. As it turns out, there’s no real reason for him to have the newspaper ad — Collinsport isn’t that big, he knows where Brewster’s is — but the rule for this episode is that “as it turns out” doesn’t matter. Tearing the ad out of the paper was a thing for David to do in a scene, which signaled to the audience that he’s interested in going shopping. It doesn’t really matter why he needs the paper, or why that guy was staring in the antique shop window, or why the same guy sneaks into Collinwood for a little aimless trespassing. 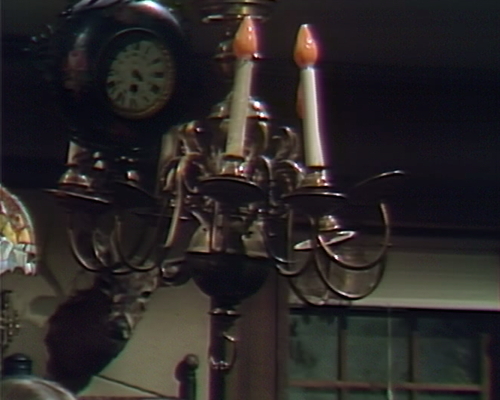 Because that’s the thing that we’re doing next, is watching a guy in a trenchcoat enter Collinwood and fuss with the decor. We don’t see his face, because he is a mystery man, who’s probably Quentin but who even knows at this point. 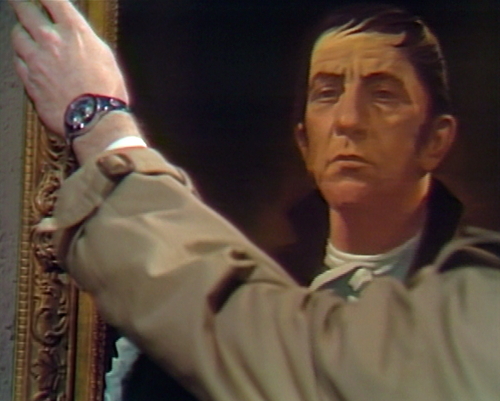 There was another mystery man a few weeks ago, pulling this exact same trick — silently entering other people’s houses, and looking at portraits of Barnabas Collins. We thought it was Quentin last time, but that mystery man turned out to be Paul Stoddard, so this one could be anybody, from Burke Devlin to the owner of Brewster’s department store. The only thing we know about this particular mystery man is that he wears a wristwatch. We see him a few times this week, and they keep making a big deal about the watch, to no particular effect. He just strolls into a room and puts his wrist somewhere, and allows the camera to do the rest. Carolyn hears somebody shuffling around, so she comes back in, expecting to find David. The mystery man hides behind some drapes in the drawing room, and waits until she’s folded up the newspaper and turned all the lights off and gone upstairs. Then he emerges, and we follow his feet as he crosses the foyer, and then we get another shot of the watch. Seriously, I have no idea. This is what the show is like now — breathing and chills and lights going out and books opening by themselves and phone calls and boxes and wristwatches and Hitchcock chairs and dreams and department stores and pentagrams and pig weasels and hearing noises and buying portraits and terrible premonitions and glorious garments and scrolls and fathers and betrayal and babies and somehow, at some point, the end of all things. 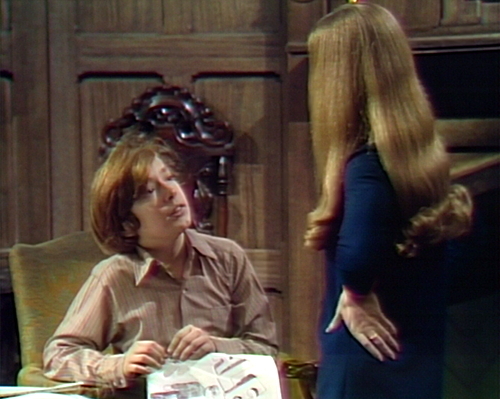 And the day shall come when Dark Shadows makes sense again, I suppose, although I wouldn’t put money on it. Tomorrow: Sentences Taken at Random from H.P. Lovecraft Stories That I Have Not Read. At the beginning of act 1, when Megan tells Carolyn that the breathing sound is the radiator, something peeks into the top of the frame. It doesn’t look like a boom mic, but it’s some kind of equipment that shouldn’t be on screen. At the end of act 2, just before the camera fades out, it looks like Paul is starting to mouth something to Liz. Charles Rush is the stand-in for Grant Douglas in today’s episode; this is the first of four appearances on the show. We’ll see him next in March, as a hand reaching out of a grave. This is our first real look at David’s room since before 1897, and he’s lost some of his stuff. He’s still got the two concert posters, the cars, one robot toy, the globe, the US map, the nutcracker/soldier thing, the green box with white spots, and the two groovy cutout figures with protest signs. But he doesn’t have the toy sailboat, the ship in a bottle, the cat poster, the football player figure or the other two robots. The only new item is a small trinket box on his dresser that we don’t get a good look at. But don’t worry about the football player; we’ll see him by the end of the week. See “The Room” for more on my obsession with David’s stuff. Also in today’s episode: David says that Brewster’s is open nights until Christmas. Is this the only mention of Christmas in the entire show? I had to look for it, but did find it; Quinn Martin tried an Invaders reboot in 1980, called “The Aliens Are Coming!”, which never got past a pilot movie. There was also a 1995 TV ‘mini-series’ starring Scott Bakula! Speaking of David’s things, I hate to think he ever got rid of that Nehru jacket. There’s also a character called The Breather in the 1981 movie Student Bodies, which I’m always reminded of when I see — and hear — these episodes. 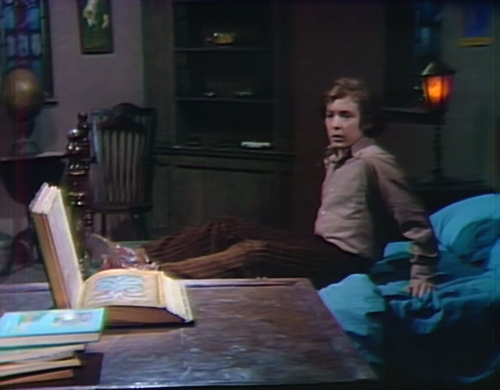 David also still has in his room those nifty black chalice lamps with the glazed orange lighting, one of which is shown on the bedside table by the window as David looks across to his desk to see the Leviathan book opening by itself. We’ll see larger, taller versions of these lamps in Sky Rumson’s drawing room. Also in episode 123 when Laura first shows up and is in the Collinsport Inn Diner, Maggie asks her if she’s in town for “the holidays.” It’s not an exact reference to Christmas but the episode was aired in mid-December so certainly viewers would have assumed that’s what she was talking about. Yes! It’s almost like in the first year of the show they weren’t allowed to mention “Christmas”, like in that first year after Barnabas’ arrival they couldn’t say “vampire”, instead, that December of 1966 they just had to let ABC announcer Bob Lloyd say over the credits, “On behalf of our sponsors, we would like to wish you a very happy holiday season.” — which we start hearing at the end of episode 126 (broadcast December 19). It would’ve been great fun if Dan Curtis had been able to fulfill his wish, an idea he’d been toying around with as each Christmas season came and went, to drop everything around the holiday season and do the Dark Shadows version of A Christmas Carol. At a convention in 2001 he expressed that this was his one regret. OMG! The War on Christmas has been going on for longer than we knew! Or maybe there has never been a War on Christmas and people generally were trying to include all holiday celebrations that fall around December. Then Carolyn comes in, suggests that it would be a great idea for Buzz to take him out on a bike ride that he’d never forget. Hooray, I threw that question out in the vague hope that somebody would know other examples. You are awesome. Still, it was at the back of my mind that there were these references somewhere early on. There’s just so much in this show throughout that you can never possibly recall everything all at once, let alone pinpoint exactly when and where something in particular is mentioned. Yeah, they do sound similar, don’t they? What I want to know is why David didn’t have a record player in his room. I was David’s age in 1970 and believe me, all us kids had a record player, Monkees albums and a stack of 45’s. It was a big deal and makes no sense that David doesn’t at least have a record player in his room – even if he never turns it on. – hey, Quentin had one, why not David? We didn’t have a Collinwood-sized house, but it was big enough, and we didn’t keep record players & TVs in our bedrooms. They were in the playroom or the family room or wherever. Well, there’s certainly not any in the drawing room, either. And nobody had a TV set either, except for Buffy in parallel time. And it’s never turned on. In episode 27 there’s a television set in Stuart Bronson’s hotel room, but that’s up in Bangor. (If you compare images from episode 27, at 7 minutes 57 seconds, and episode 1006, both of which are in black and white, they appear to be one in the same prop, or at least near identical in size and design.) Imagine that: Bronson has an ordinary hotel room at the Bangor Pine Hotel that has a TV set, while Burke has a three-room luxury suite on the top floor of the Collinsport Inn that has no TV set, just a portable radio. But, of course, how could Sam have seen those commercials on TV, when there was no set at the Evans cottage? Likewise, the Blue Whale had no TV over the bar, just the jukebox off to the side. Even rich girl Carolyn – who is certainly of the Flower Child generation – even she didn’t own a record player. When she brought Buzz home to dance, she had to turn on the radio in the drawing room. It’s just not acceptable that Carolyn didn’t have some albums – the Mama’s and the Papas, Cream, the stones and the Beatles anf for the love of God, that damn Nancy Sinatra Album EVERY girl in America owned – These Boots are Made for Walkin’. Didn’t Dan Curtis have teenaged daughers around this time? Surely they said Dad – please buy David and Carolyn a record player prop so they don’t look so square. In two early episodes from 1966, they did have Beatles tunes occasionally playing on the Blue Whale jukebox — but alas, only the instrumental “Muzak” versions of Yesterday and She’s A Woman. I did see in one episode, when Vicki was visiting in Carolyn’s room, that she did indeed have a small record player on the bedside table by the door. And there was even a record on the turntable, which Vicki was about to play but didn’t. Most likely it was the Best of Robert Cobert. She did like to frug to those Cobert surf guitar instrumentals. There’s an episode coming up next week (908) where Roger gives David a transistor radio that plays Blue Whale tunes. Unfortunately, he loses possession of it immediately, so Collinwood remains under a media blackout. I guess that’s what happens when you’re home schooled – your rich father can get away with giving you a crummy radio while everyone else your age has a portable cassette player. I got my first cassette player in 1970 and promptly bought the new Paul McCartney solo album to go with it. Burke Devlin had a radio in his room (one day, at least) at the Collinsport Inn. He turned it on for some music one night when, if I remember, Vicky was coming over. Carolyn did have a record player in one episode — 101 from November 1966. She’s seated in front of her dresser mirror prettying herself up for a dinner date at the Blue Whale with Burke Devlin, slapping some perfume on her neck and wrists while Vicki is standing by trying to get to the bottom of something about Roger and a filigreed fountain pen. Then she goes over near the door. There’s Carolyn’s bedside table which holds a lamp and then in between that table and the door there’s another table that has a record player, which looks like a suitcase that’s wide open. Then Vicki goes over to the record player and switches it on. There’s a 45 rpm record there, but it doesn’t have one of those little thingies in the middle, those little plastic fittings you’d insert to keep it steady, so when Vicki hits play the disc just wobbles all over the place there on the turntable, and then she turns it off. Probably not even the actors in that scene knew what the 45 rpm record was. Had Bob Cobert released any singles at that point? One thing’s for sure: It was the first and last time a record player was ever seen at Collinwood — and you’d have to go back to 1897 to ever see another. They probably didn’t get any channels, so they didn’t bother. All antennae in those days. The ghosts interfered with reception. Buffy the Vampire-slayer? I don’t remember that ep. Oh yeah, she was the young actress who yelled all her lines. Was she related to Addison Powell? Old Man Brewster was coming around to do some direct marketing about his wristwatch sales. I still haven’t seen the Tim Burton film, but I always hear that it goes to the other extreme, by being FULL of pop culture stuff. If I have to choose one extreme or the other (not that you always have to), it’s the way the original DARK SHADOWS did it, where you have trendy Carolyn and not too much else that’s trendy. I think it’s better to be wrong on the side of caution when it comes to that. We also have a mention of Christmas episdode 1050 where Quentin’s ‘gloves he received last Christmas’ are presented as evidence of murder (*echoes: murder, murder, murder). There’s JUST been a mention of Christmas in the show a few episode earlier. The first mention of the antique shop comes just after Julia asks Carolyn if she’s wrapping something early for Christmas. And the day shall come, when the child shall be dressed in glorious garments. Which shall be of finest Ohrbachs overstock purchased at Brewster’s Department Store. The prominently-displayed wristwatch WAS FRIGHTENING! It gave me nightmares that…Peter Bradford/Jeff Clark had returned! Remember? Vicki gave him a wristwatch before he vanished? In Episode 810, Christmas is mentioned twice in the same scene. This episode originally aired on August 1, 1969, so the holiday references obviously have nothing to do with the in-story setting. Both the chocolates and the card could have just as easily been sent for the respective characters’ birthdays. I’ve decided that the reason Christmas was mentioned is because Sam Hall, speaking to his cohorts from “China” (under the coffee table) challenged them to have a character make a non-ridiculous reference to the holiday, during the height of summer.